At dusk tonight, the sun set behind the desert mountains – soft and sweet. But there’s little sign that the cosmic careers of the Williamses are about to set. Serena, the brightest star in women’s sports, and her sister Venus – the most planetary of all athletes – continue to orbit with a bright shimmer that still dazzles. Now, 17 years after their black-hole experience in 2001, the two would meet for the first time on court in Indian Wells. After all, wounds do heal. Times change. Writer Steve Tignor noted that in 2001, aside from the Williams sisters, the 150-player field featured just one other player of African-American heritage, Alexandra Stevenson. This year, fifteen of the most charismatic players in the desert were of African heritage. And, most importantly, virtually no one noticed. So as “Blank Panther” rocks your movie palace, black powerhouses light up your favorite tennis palaces. None other than tennis historian Roger Federer (who has two daughters and knows a thing or two about sisters) put the Williams legacy in perspective. “Longevity and dominance” is their key, he noted. “They had a massive arrival, a lot of buzz, and they lived up to the hype. They came out and crushed it. “From the very beginning, they were very interesting. They hardly played any juniors, which made it more of a mystery, because you just didn’t know what to expect. And they were coached by their dad – it’s an incredibly fascinating story. “For years we were worried that they were going to check out early with sickness or injuries. We weren’t sure if they were going to play as long as we hoped they would. And [now], here we are! They are both over 35 and still playing at the top – Serena being a mom, [and] Venus overcoming a lot of difficult situations. “Being older than Serena myself, it’s wonderful to see. I’m very happy for them, especially now since Serena’s had the baby. That’s maybe the story of the year. 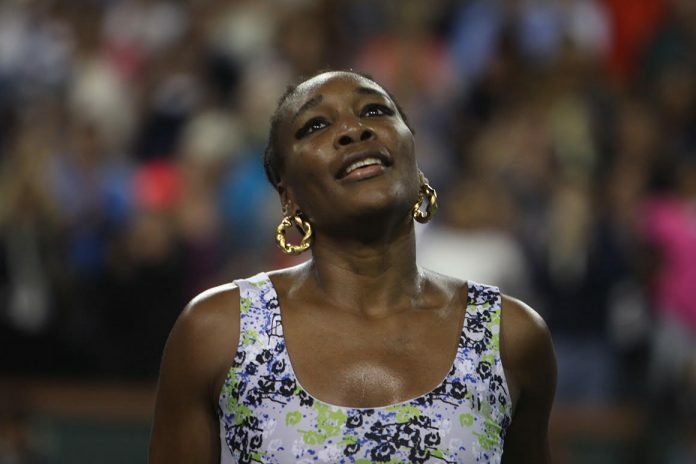 Hopefully she’ll decide to play a lot and enjoy herself and get back – who knows how high? It almost doesn’t matter, but it would just be amazing to see her do it. No kidding. The desert throng welcomed the sisters with thunderous applause. Statisticians noted that Serena had a 17-11 career lead over her elder and had won eight of their last nine matches. Now, observers wondered if the older Venus, who famously beat Serena as a junior and then gave her the trophy, would continue her role as the caretaker, and somehow let up and take sympathy on her younger, quite rusty sib. After all, Serena was playing in only her third match since her 14-month break. But worry not. Venus asserted herself, playing quick-strike tennis with serve-and-forehand combos that instantly put Serena on the defensive. Unlike in many of their past matches, Venus was the superior server. Winning eight points in a row, she held at love, then broke her sister for a 4-2 first set lead. A few longer rallies began to creep into the match, but Venus ended the first set decisively, nailing down two aces in a row to take it 6-3. In the second set Venus broke twice and raced to a 3-0 lead as Serena too often sprayed errors. But then, as older sister struggled to shut the door, the match began in earnest. Rallies increased, Serena began employing crafty drop shots to set up winners, and Venus’ forehand – the shot of the night – finally began to misfire into the net. But, once again, big sister’s serve bailed her out, as Venus fought off a break point and eked out a final hold for a 6-3, 6-4 victory. Despite the setback, Patrick Mouratoglou, Serena’s insightful coach of nearly four years was upbeat. He told IT, “I’m very positive. Serena showed that the base of her game is there. She played well. She also showed she’s not ready and there are things that need to improve. “But I’m very pleased. She has a strong base. But to play Venus when she plays like that, you need more than a base, you need the details. She can still improve her fitness. She has to serve much, much better. Her serve is the only shot that is far from the level she used to have. I’m not worried, but we have to work on it. There are a lot of details. She rushed a lot today. “We have to credit Venus because she played a very high quality match from the start. She played super fast and Serena felt she needed to do more. But she couldn’t because she’s not 100 percent. I’m very glad Serena’s started competing – by Roland Garros she’ll be ready – and that’s great. There’s nothing better than competition. First, it makes you improve, and second, it shows you where you are. That’s important. Exactly. So tennis’ two most galactic gals seem to be ready for quite a take-off. They certainly should give us all a boost this year. And it doesn’t take a rocket scientist to predict that this should be quite a fascinating season, out there in tennis space.